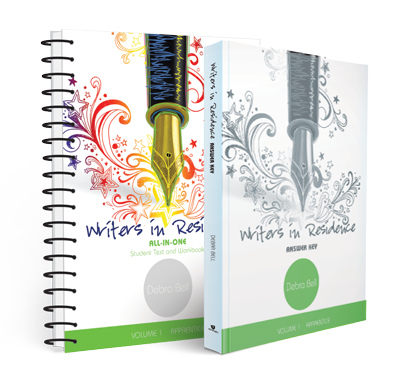 Writers in Residence is an all-in-one writing curriculum appropriate for students in grades 4 through 8 from Apologia Educational Ministries. This curriculum not only teaches students to write using their own unique voice, but also teaches grammar along the way. Since I have an advanced 3rd grader, a 5th grader and a 6th grader this year, I wasn’t sure which student would use this curriculum for review, but I knew if it was from Apologia I wanted to try it! My 5th grader did not enjoy her grammar program this year, and worse, much of the grammar she learned didn’t seem to transfer from her grammar workbook to her writing. I’d point out simple mistakes in her school work such as capitalization and run-on sentences and she’d act as if I was presenting completely new information. Once Writers in Residence arrived, I looked it over, and it was clear this was a great choice for my 5th grader. It’s important to note that this curriculum is the first volume in a planned 4 volume curriculum lineup. When I chose curriculum, I hope not to have to start from scratch each year in the decision making. I was happy to learn this curriculum could be a good choice for all of middle school (at least). She’s also a very independent learner, happiest when she can teach herself and this curriculum is perfect for that. All the teaching is directed at the student in conversational text, right in the workbook! The book begins by explaining the six good traits of writing to the student and introducing the writing process before going into the teaching modules. 6 Spotlights on Christian Writers are scattered throughout the book. My student particularly enjoys these sections. It reminds her that learning to write well has purpose! Rather than a teacher’s manual, this curriculum includes an answer key, because the teaching is in the student book! The answer key contains the answers or sample answers for the student text and workbook. The answer key also explains assignments to the teacher, provides charts to keep track of progress, and helps you evaluate your child’s work with rubrics. This program is meant to be very flexible- you can choose to work from 3 to 5 days a week, breaking the material down as needed for your child. However, a suggested 32 week, 4 days a week schedule is printed right in the workbook with checkboxes the student can mark as assignments are completed. This is perfect for my independent learner and our typical 4 days a week school schedule. During our review my student worked through Unit 1: I Remember which concentrates on writing good sentences and action verbs, nouns, conjunctions, subjects, & predicates. Grammar work was well explained and interesting throughout the modules. Sentences and examples were taken from When I Was Young in the Mountains, a picture book our family loves. It made the grammar work more interesting, and provided context for the work of writing her own memories presented in the first unit. The actual writing was broken down into manageable chunks. While this curriculum is a workbook, the writing sections really do leave space for individuality and voice to come through. For example, when sentences are written about childhood memories, the student then cuts the sentences apart in order to rearrange them in the order that feels right. The students are encouraged to try chronological order or topical order for their sentences to help decide the order. At the end of the Unit, my student had a essay about her favorite childhood memories, that was well written and meaningful to her. This curriculum is definitely a good fit for my 5th grader, and I’m excited to continue it with her next school year. Connect with Apologia on Facebook, Twitter, Pinterest, and Instagram. Read more reviews of Writers in Residence from The Review Crew by clicking below. All the reviews I'm reading are from people who looked at or had just started this curriculum. Can you tell me how you liked it at the end of the year? Was it consistent in the amount of work required (of student and teacher)? Did you feel it made your student a better writer? How does it compare to others you have tried? It's a pretty thick book with a higher price than some others, so I was wondering if it was worth it. Any info would be appreciated. This ended up not being a great fit for my then 5th grader. She had much difficulty and frustration with the creative writing aspects of the program. She did better with report and essay writing instruction until she reached logic stage, at which point creative and open ended writing came more easily for her.